We want to ensure our customers have the best tools to focus on their sales without having to worry about admin work. You need to know whom to focus on, what deals deserve immediate attention, how they affect your projects and sales pipeline and where that information needs to go. We see our customers putting Pipedrive to work through their entire sales cycle, from lead management to project tasking and marketing outreach. We know hundreds of apps are out there to capture data you need in Pipedrive, or to which you want to send items at various stages of your deals. That’s why, among our many app integrations, we integrated with Zapier, enabling you to connect Pipedrive with more than 500 business apps quickly and without any programming knowledge. Those connections just became more powerful with Zapier’s newest update: the ability to create complex workflows with Multi-Step Zaps. Before you were limited to one-to-one integration — you could either send data to or out of Pipedrive. Today, there are one-to-many integrations; you can engage a workflow with as many steps as your pipeline requires. You can still use Zapier to capture new contacts as leads in Pipedrive. But now you can also look up additional contact information with FullContact, send out a personal email to begin a conversation and add them to a MailChimp list for future marketing communication, all with one Zap. When a deal matures, a single Zap can add a task to your Todoist account, notify the team on Slack, and prepare a checklist for your sales team in Trello. No matter how many different apps you use, Multi-Step Zaps enable you to customize an automated workflow according to your needs. If you receive emailed proposals, Multi-Step Zaps offer a one-click solution to set everything up on your pipeline and let your team know about the potential so they can take action immediately while you move on. An automated workflow can trigger when you Star an email in Gmail, create a new Pipedrive deal in response (complete with a person and organization from the recipient details) and shoot off a channel message on Slack so everyone on the team hears about it. Want to assign a deal owner depending on the type of email? 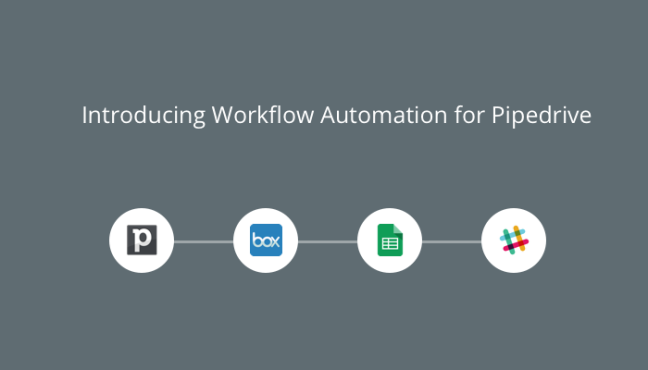 Set up workflows to trigger on new labeled emails instead, with different Pipedrive deal owners for each label, and send a direct Slack message to that user instead of the whole channel. User engagement is fickle, easily fading into lack of interest if not pursued immediately. With a Multi-Step Zap you can process new lead information, capture them for future marketing, and reach out with a personalized response — all at once. Triggered with a new form submission, for example, it would then add the person to Pipedrive, create a note with the form information (matched to their ID from the previous action), subscribe them to your mailing list and wrap up by sending your lead a personalized email designed to follow up on potential opportunities. You rely on deal stages to greenlight the next step in your processes; your automated workflow should reflect this. Put together a Multi-Step Zap triggered by that event to keep you from missing a beat: you can schedule any kind of new activity, set up a task on Trello to tackle the action items, and send out an email to notify internal stakeholders — or let the client know you’re on it. Search Actions: No more duplicates! Say you have a form to receive proposals, but allow submitters to make more than one. Keeping everything together is essential for the big picture, so you set up a Multi-Step Zap. It triggers whenever you receive a new entry on Typeform, stores a file on Box, then performs a search action to check if the email they provided already matches a person on Pipedrive. If not, a new note is created and attached to them, and a new folder is created on Box to store the file they upload with the form. If they already exist, then the note is added alongside any others that came before, and the file is dropped in the same Box folder as their other items, keeping everything together without the need for painstaking manual de-duplication. You can put Zapier’s new Multi-Step Zaps to work with your Pipedrive processes in myriad ways, from parsing through customers and generating leads to taking action and communicating around deals close to closing. Head to Zapier and browse through hundreds of Pipedrive integrations, or jump in and start building Multi-Step Pipedrive workflows. Zapier’s Multi-Step Zaps work with hundreds of popular apps you already use, like Todoist, FreshBooks, Eventbrite, Zendesk, WooCommerce and Google Sheets, and are as just as easy to put together without any programming skills. Get started with Multi-Step Zaps today!